2+1 road with cable barrier near Linköping, Sweden. Classified as motortrafikled (expressway). Driving on a Swedish 2+1 road as it narrows from 2 lanes to 1. As the 2+1 road ends, overtaking cars face oncoming traffic. 2+1 road is a specific category of three-lane road, consisting of two lanes in one direction and one lane in the other, alternating every few kilometres, and separated usually with a steel cable barrier. The second lane allows faster-moving traffic to overtake slower vehicles at regular intervals. Traditional roads of at least 13 metres (43 ft) width can be converted to 2+1 roads and reach near-motorway safety levels at a much lower cost than an actual conversion to motorway or dual carriageway. In the Republic of Ireland, a 2+1 road was trialled on a short section of the N20 near Mallow, County Cork and the N2 near Castleblayney, County Monaghan. Following the pilot the National Roads Authority announced in July 2007 that 2+1 roads were unsuitable and that new lower capacity trunk routes would instead be built as 2+2 roads (officially known as "Type 2 Dual Carriageways") – at grade dual-carriageways with a narrow median and no hard shoulder. 2+1 road with cable barrier near Skara, Sweden. In Sweden, many 13-metre-wide (43 ft) roads have been built, especially in the period 1955–1980. These have two 3.5-metre-wide (11 ft) lanes, and two 3-metre-wide (9.8 ft) shoulders, in the beginning planned as emergency strip, due to the relative unreliability of autos of that period. Around 1990, the idea emerged to build fences in the middle of them and to have 2+1 lane. This would be a cheap way of increasing traffic safety, since these roads have had a bad safety record. The width invites high speeds. Some people were, for example, overtaking against meeting traffic assuming meeting cars would go to the side. The roads are a little narrow for 3 lanes, but trials were carried on a few roads. It turned out that not only did safety improve, but it was also easier to overtake than before as the 2-lane sections provide safe overtaking opportunities. After the year 2000, more than 1,000 km (620 mi) of roads in Sweden have been converted from wide ordinary roads into 2+1-road, all with barriers. Until recently, the roads had the original 90 km/h (55 mph) speed limit in use on most highways. As a result of this, many people drove at 90 km/h at 1-lane parts but 110 km/h (70 mph) at 2-lane parts, this being the speed limit on motorways. The speed limit has now been changed to 100 km/h (60 mph) with a notably smoother traffic flow. In Portugal, there are plenty of 2+1 roads. Almost every national road in the country has a 2+1 profile, but the biggest part is located on the north, because of the hills (for example, in Beira Baixa, or Viseu). One example of this is the N2 road on Portugal, which goes from Faro (Algarve) to Chaves (in the north) Also, this type of road isn't frequently used on parts roads that have a village near, except in the Lisbon District, which most of them have that profile as well (for example, in Sintra). In Portugal, there are 4 (major) types of roads: a national road (N) which sometimes contains the 2+1 profile, an complementary route (IC), which always contains the 2+1 profile, except inside villages, a principal route (IP) which either contains the 2+1 profile (with the IC profile) or the 2+2 profile (with the A profile) and a highway (A) which has its own profiles, like 2+2, 3+3 or 4+4. The "2+1-System" refers to expressways with three lanes on a single carriageway where bypassing on the lane of the opposite direction is prohibited so that speed restriction is not required to increase safety. These expressways are grade-separated with a design speed of 100 to 120 km/h (60 to 75 mph) and the side of two lanes (allowing to bypass lower speed vehicles) alternates about every 1.5 to 2 kilometres (0.9 to 1.2 mi). In hilly country the uphill direction is usually the one with two lanes to allow overtaking of heavy, slow vehicles. In many cases there is no median barrier or it consists of concrete blocks – additional safety measures are mostly needed near the end of the two lane section where some motorists tend to pull in very late so that a longer no-traffic section needs to be inserted on the middle lane. After some good experiences with test roads the system has been used often in places where the amount of traffic does not justify construction of a dual carriageway expressway but remote rural areas should be connected to major towns with a high speed road. Existing examples are B 1, B 4 near Uelzen, B 16, B 20, B 31n near Stockach (120 km/h (75 mph)), B 33, B 54, B 56n, B 67 between Bocholt and Rhede, B 72, B 210, B 300, B 482. The first 2+1 road in Finland was opened in 1991 on Finnish national road 4 between Järvenpää and Mäntsälä, since then upgraded to a motorway. Since then, numerous 2+1 roads have been built into the national road network. They resemble motorways in that they are typically, although not always limited-access roads and have no at-grade interchanges. In mid-1990s, 2+1 roads with traffic separators were introduced; these are effective in preventing head-on collisions, approaching the safety of motorways. In 2006, there were 440 km of 2+1 roads,  e.g. along road 3 and road 4. However, they weren't that much of a panacea: interchanges made the roads much more expensive than planned and confusing to drivers. Thus, new construction halted and only 2+2 roads with traffic separators were built. These are however more expensive and require more widening of the road. Some of Federal Roads use scheme 2+1. Length of overtaking sections is 400 to 3,000 metres (0.2 to 1.8 mi). Unlike western countries, almost all of Russian 2+1 roads are not equipped with barriers yet. The most well-known example of 2+1 is M-10 road section between Tver and Novgorod oblast. This is very popular type of roads in Krasnodar Kraj and at Sakhalin Island. The construction of 2+1 roads in Estonia first started in autumn 2016, when a contract for a reconstruction of a 9-kilometer (5.6 mi) section of the national road 4 between Ääsmäe and Kohatu into a 2+1 road was signed. The road is being reconstructed as a 15-metre-wide (49 ft) 2+1 road, equipped with barriers along the whole length. Also there are several sections of the national road 2 between Põltsamaa and Tartu planned for a conversion into 2+1 road. The first of them (Annikvere-Neanurme) was opened in November 2017. The speed limits are 100 km/h (60 mph) during summer and 90 km/h (55 mph) during winter. First rural 2+1 road section finished in Lithuania was short 1.5 km (1 mi) road section of A11 between Šiauliai and junction with A18 road (Šiauliai Bypass). It was opened in late 2017. All 1+1 sections of Via Baltica north of Kaunas up to the Latvian border are planned to convert to 2+1. First section, A17 road or Panevėžys Bypass is currently under construction. Works are taking place in stages. First 10 km (6.2 mi) long section between junctions with A8 and A9 will be finished in summer 2018. Remaining section up to A10 road will be finished in 2019. All planned 2+1 sections will be equipped with barriers. In New Zealand, there are few 2+1 roads, although regular isolated 'passing lanes' exist frequently throughout the country, mainly in heavy trafficked areas and on hills. A trial of a 2+1 road with wire-rope median barrier was undertaken on SH1 between Longswamp and Rangiriri south of Auckland, and there are plans to introduce more 2+1 roads. NZ research also investigated design and operational effects of 2+1 roads to establish the most appropriate configurations for the country. Divided 2+1 roads are rare outside of Europe, though they are seen in a few places, such as the Canadian provinces of Ontario and Quebec, New Hampshire state in the US, and Australia. The most prominent example is Interstate 93 in Franconia Notch State Park (before dropping down to a single lane in each direction, plus steel divider). In Australia the Pacific Highway features sections of 2+1 along its length between Brisbane and Sydney. 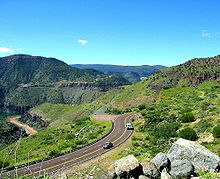 The mode is not unknown in the United States off the Interstate roads, including for example Arizona State Route 77 north of Oracle. In Japan, a 2+1 road was implemented in the northern island of Hokkaido. Sometimes, during freeway reconstruction, a barrier transfer machine will be used on one half of the freeway while the other is being reconstructed. A similar concept is utilized with 3-lane setups where 2 lanes have right of way, and the opposing side has to yield to the oncoming side on major highways that are mostly 2 lanes, of which those are more common. These roads also exist in Texas, which calls them "Super 2", as that term has more than one definition. In the 1950s, New York state built many highways which totaled 3 lanes wide, withtraffic moving in either direction permitted to use the center lane for passing. After less than ten years of a frighteningly high head-on collision rate, all were re-striped into either two wide lanes, or a one-direction passing lane, or alternating between the two systems. ^ www.nra.ie. Retrieved January 16, 2019. ^ "Nordecon and Road Administration signed the contract for the construction of first 2+1 passing lanes on Tallinn-Pärnu-Ikla road". Nordecon. 26 October 2016. Retrieved 6 January 2018. ^ "Ääsmäe–Kohatu 2+1 möödasõidualade ehitus". www.mnt.ee (in Estonian). Maanteeamet. Retrieved 6 January 2018. ^ "Tallinna-Tartu maantee esimene 2+1 möödasõiduala avatakse liiklusele". ERR (in Estonian). 9 November 2017. Retrieved 2 January 2018. ^ Kazunori Munehiro (2015), Performance Evaluation of 2+1 Lane Highway in Hokkaido, Japan: Case Study of Saraki-tomanai Road, 5th International Symposium on Highway Geometric Design, Vancouver, Canada. Wikimedia Commons has media related to 2+1 road.